A 70-year-old man was referred for evaluation of haematuria. 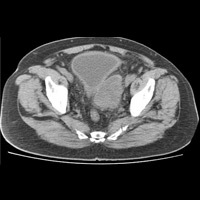 • Bladder diverticula have an increased risk (2% to 10%) of developing cancer because of stasis. All major epithelial types have been reported, but urothelial cancer is the most common neoplasm in bladder diverticula. • These tumors behave in a similar aggressive manner as those found in other bladder locations because tumor cells have ready access to surrounding organs and angiolymphatic spaces once they have reached this depth of invasion, irrespective of the presence of a muscularis propria (detrusor muscle) layer. • Bladder cancer arising from diverticulum has a poorer prognosis than does cancer arising from main bladder lumen because of early transmural tumor infiltration (early spread to surrounding structures). Therefore, imaging plays an important role in early diagnosis and staging. 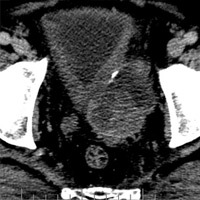 • Nonenhanced CT (Figure 1) shows a large diverticulum with a narrow neck arising from the left postero-lateral wall of the bladder. • Contrast-enhanced CT (Figure 2) shows a linear calcific focus in diverticular anterior wall. Note the irregular wall thickening and a sessile mass protruding into diverticular lumen. • Delayed contrast-enhanced CT (Figure 3) shows contrast agent entering the neck of diverticulum. — Gopalaratnam Balachandran, MD, is a consultant radiologist at Government General Hospital in Pondicherry, India. Tamas EF, Stephenson AJ, Campbell SC, Montague DK, Trusty DC, Hansel DE. Histopathologic features and clinical outcomes in 71 cases of bladder diverticula. Arch Pathol Lab Med. 2009;133(5):791-796. Wong-You-Cheong JJ, Woodward PJ, Manning MA, Sesterhenn IA. 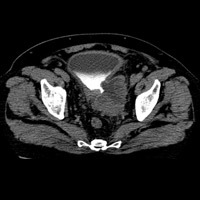 From the Archives of the AFIP: neoplasms of the urinary bladder: radiologic-pathologic correlation. Radiographics. 2006;26(2): 553-580.